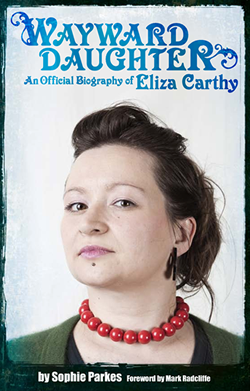 Wayward Daughter: An official biography of Eliza Carthy: Wayward Daughter - on CD and e-book! Wayward Daughter - on CD and e-book! Amazing news, Eliza fans... 3 June brings Eliza's full career retrospective: a two-disc delight containing some new, some old, some very old, and some ancient, all picked by fRoots editor, Ian Anderson. And it's called... Wayward Daughter! Hurrah! Make sure you get your mitts on the autographed version by pre-ordering through Proper. And even better? We're currently road-testing an e-book version of Wayward Daughter, complete with additional new chapter (happenings in 2012 and beyond), which will be out around the same time. Check back here to learn about the wheres and hows. And lastly? Watch this, the official video of Eliza's Jack Frost.